The first calibrated and fully operational environment-monitoring picture frame unit rolled off my “assembly line” yesterday. The following photos show this operational unit deployed and collecting data in a location on the second floor at Aardenburg Imaging & Archives. The first production unit is now collecting environmental data (light, temperature, and relative humidity) on a second floor location at Aardenburg Imaging & Archives. Sunlight is striking the print at a raking angle at 4:01pm on October 12, 2007. Minutes later at 4:05pm, the light has changed dramatically compared to the conditions documented in the preceding photo. Cloud cover has shielded the sun, and light levels have dropped significantly. 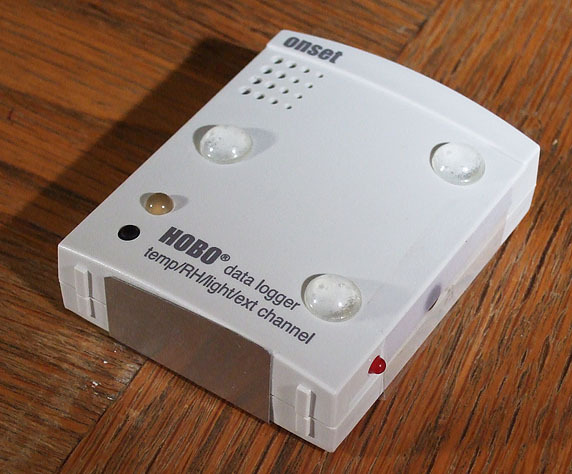 Many measurements are needed to evaluate the real world environment, and the Hobo data logger is set to record thousands of measurements each month. 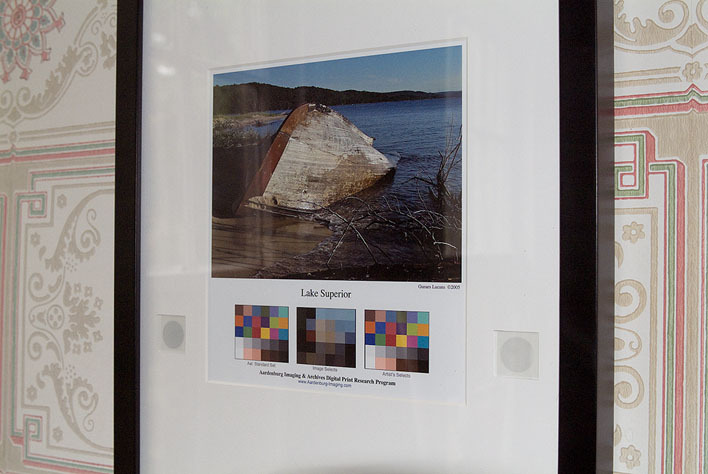 This closeup view of the print shows the image and one set of color patches that will be evaluated for change over time. The other set of color patches is covered by the window frame mat, and the light sensor ports, complete with opal glass diffusers, can be seen on each side of the color array. 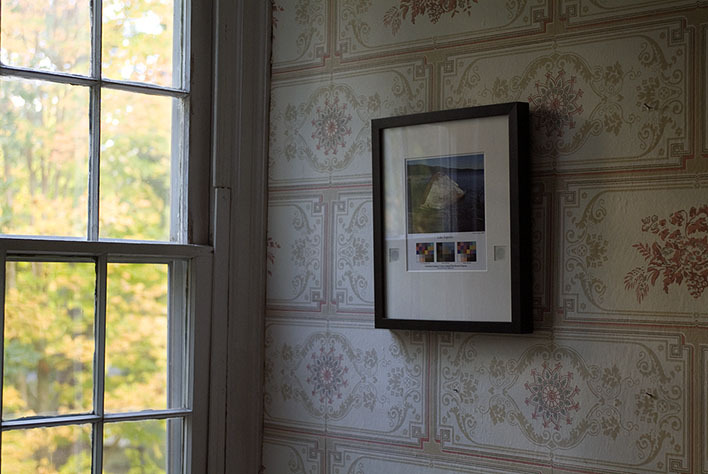 The print installed in this frame was contributed by Gunars Lucans. It is an inkjet print made on an Epson R1800 with MIS R800 Ultrachrome Equivalent Ink on Red River Ultra Pro Gloss Plus paper. 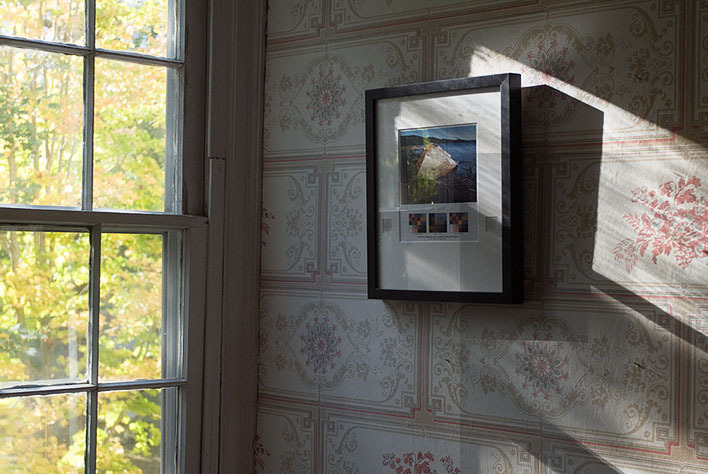 The print is now hanging on a wall closely adjoining another wall with a west facing window. The outside environment is largely shaded by trees but direct sunlight can glance through and strike the print. The photos illustrate the sharp raking angle of this direct light as well as more uniform diffuse light when cloud cover is present. The two images were taken only minutes apart, and they represent only two of numerous lighting variations rapidly dancing across the surface of the picture today. These variations do average out, but it takes many readings to corroborate that fact. The high glancing angle of the sunlight reduced incident energy at the print surface greatly compared to the level one would expect if the sunlight were striking perpendicular to the print surface. This result is characteristic of the well known cosine function fall-off for this type of optical geometry, and is why opal diffusing glass is also incorporated in the optical path of the data loggers installed in the picture frame. I also mention this result to demonstrate the importance of multiple measurements. Any one measurement can in no way adequately document the real world dynamics occurring on the surface of the print. The data loggers will take thousands of measurements each month. First production unit lies on my work bench with calibrated dataloggers installed and recording. I’ve spent much of my time this past month working out many details on efficient installation and calibration of the data loggers. Sheet metal flashing from the local hardware store has become a favorite item of mine. I have used it to fashion simple but effective retaining clips and a cover plate for the back of the data loggers. The purpose of the back cover plate is to block holes on the back of the logger including the mini USB data port so that the only significant air passage into the logger is from the venting grill on the front side. This grill faces the matting and print materials. 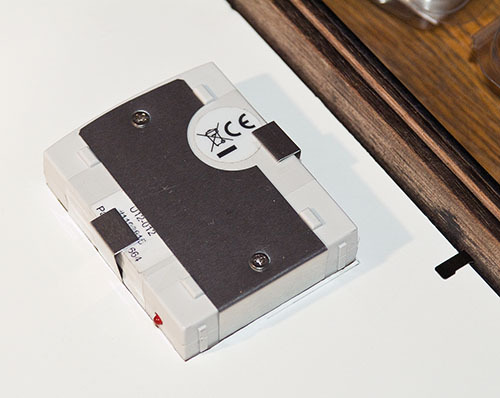 The back cover plate thus helps to ensure that the RH sensor is responding to the microclimate of the picture frame and not directly to the greater room environment. 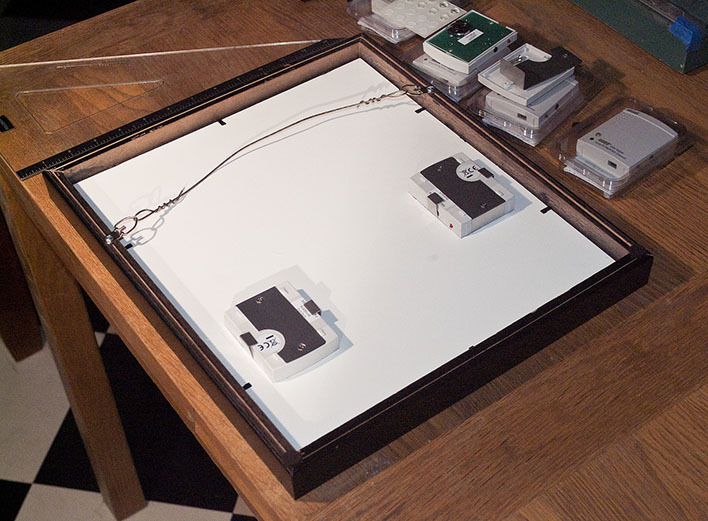 The spring clips keep the data logger pressed up against the exposure plane of the print in the frame. Even this seemingly trivial aspect of the design required some additional engineering work. The Hobo datalogger design was apparently not conceived with the idea that the light sensor would be pressing up against another surface, and the gentle curvature of the Hobo’s front panel caused it to rock a little bit when attempting to keep it flush with the cover glass (or acrylic) surface of the picture frame. A relatively simple solution was to install three chemically inert bumpons on the front of the hobo logger. Closeup of the Hobo datalogger mounted into the picture frame. The red LED light flashes to indicate when the unit is activated. The pressure from the two small retaining clips holds the unit in position with the exposure plane parallel to the print surface. Finding those chemically inert bumpons with photo safe acrylic adhesive took more time than I care to admit, but with a little help from Google, I finally found them at a company called Bumper Specialties. Inc.
Three bumpons manufactured with photo-safe acrylic adhesive are adhered to the front plane of the logger. Their pedestal forming action and rounded shape and height situates the light sensor so that it is perpendicularly oriented and in the plane of the matted picture. They also prevent abrasive contact of the small light sensor dome with the opal diffuser glass or ND filters.